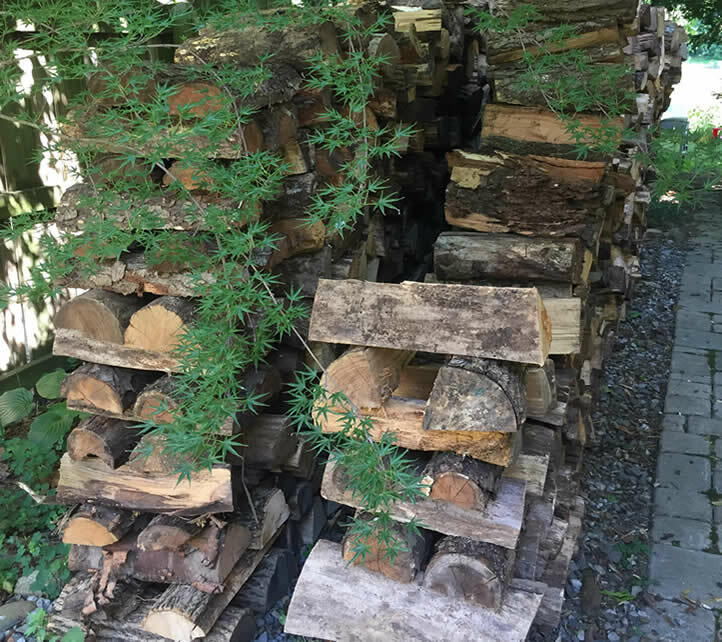 About a month ago the woodman arrived a little before 8 am on Saturday and dumped two cord of wood in our driveway – the first load of two or three more cord to come. If you have no idea the size of a pile of two cord of wood, let me tell you, it is really a lot. I was stunned when I first saw it. I knew when I saw it that I would be working with my husband to schlep wheelbarrow after wheelbarrow full of wood across our backyard and down beside our house, unloading and stacking it carefully in preparation for the cold to come months later. My husband could not do this alone. It would be too much. Besides, we both enjoy the warmth the wood provides, as do our cats. I knew, unfortunately, what I would be doing in the July heat! Patanjali in the Yoga Sutra describes the yoga of action, called kriya yoga. Kriya yoga has three components: tapas, a new behavior, often challenging, creating heat not just in the body but also in the mind as the change in behavior must be conscious and deliberate; svadhyaya, self-reflection, noticing the effects of our new behavior and making changes as required; isvara pranidhana, focusing on the quality of our actions rather than on the imagined result. In all honesty, I never liked loading, schlepping, and stacking wood. In the past my mind resisted this work, usually resenting every minute of it. But here it was again requiring behavior beyond my usual activities, beyond the demands I usually place upon my body. But this year was different. I surrendered to it. First of all, we made some agreements that acknowledged our physical limitations. We didn’t work on the woodpile every day, but we did work on it consistently over three weeks. We decided to spend 30 minutes each time doing the loading, schlepping, and stacking, and then clean up the detritus left in the driveway. We tried to avoid the hottest days, but there were a few. In the process of this work, I began to see that this was a kind of yoga practice for me, a kind of kriya yoga. While the work required a change in my usual physical behavior, the change in my attitude toward the project also constituted my tapas. Some days I did not really want to “do wood,” but I would start, focusing on what we needed to do, and doing it. It was ok. I practiced svadhyaya in observing not only my mind but my body. I reminded my self to keep my back upright without leaning forward and to bend my knees while carting the wood in the wheelbarrow. I limited the weight of the loads. I made sure to do yoga postures to care for my back. And, I realized that I was focusing on my actions, my work, doing it to the best of my ability, and taking pleasure what each day accomplished. The bigger picture for me was being able to see how changing my attitude, recognizing and adapting to my limitations, and just focusing on the quality of my action could change my entire experience. Some of the most profound changes for the better that we make are yoga that does not take place on the yoga mat. It is about seeing clearly enough to move away from behaviors and attitudes creating suffering and limiting our lives. It is moving what is positive. Yoga teachings and yoga, itself, are about life, and available to anyone interested in practicing and changing.